Your favorite fluffy breakfast dish isn't terribly high in calories -- as long as you limit yourself to just one or two pancakes. 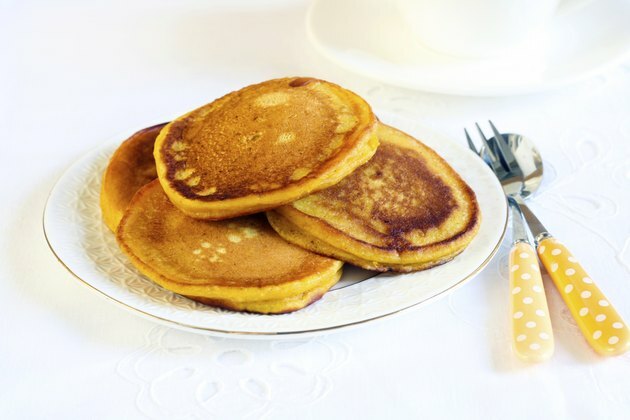 A small 4-inch pancake, weighing 38 grams, provides around 85 calories. No matter your preference -- plain, buttermilk or blueberry -- the calorie count stays about the same. A 4-inch pancake -- whether plain, buttermilk or blueberry -- provides around 2.5 grams of protein. This amounts to 10 calories from protein or 12 percent of calories from protein. You'll also get roughly 3.5 grams of fat, or nearly 32 calories from fat. This means that fat accounts for 38 percent of the overall calories in a 4-inch pancake. The remaining 43 calories -- 50 percent of calories -- come from the 11 grams of carbohydrates.